There are some other temples in the mountain, such as the Zhongyue Temple, which is nicknamed the Little Palace; the Fawang Temple and the Huishan Temple, the oldest temples extant in China; two earliest and well-preserved astronomical observatories extant in China; etc. The Zhongyue Temple is nicknamed the Little Palace. The temple is one of the oldest of its kind in China, originally built in the Qin Dynasty over 2,200 years ago, and moved to its present site in the Tang (618-907). Along the center line of the temple lie about 400 constructions of various kinds including archways, pavilions, terraces, gates, halls, and towers, as well as many (over 300) tall, gnarled and weather-beaten cypresses, mostly in the large courtyard. It covers an area of 370,000 square meters. The Songyang Academy, one of the most famous ancient academies, is also located here. Celebrities of ancient times like Sima Guang, Cheng Yi and Fan Zhongyan all gave lectures here. The building of the academy is old and elegant, but mostly broken. At the west side, there are two high and old cypresses named Great General and Second General, they are the oldest cypresses with over 4,000 years of history. 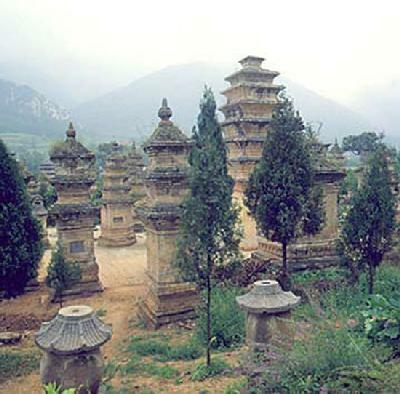 The Tower of Songyue Temple is the earliest Buddhist tower existing in China. It was built in the Northern Wei Dynasty (520). It has 15 storeys and a height of over 40 meters. With superb craft, it is the oldest polygonal tower in China.